Spain is definitely the best country in Europe for windsurfing. Thousands of kilometres of coastline, warm climate almost all year round and excellent winds statistics. Have a look at our ranking of the best beaches for windsurfing in Spanish Andalucia. 1. 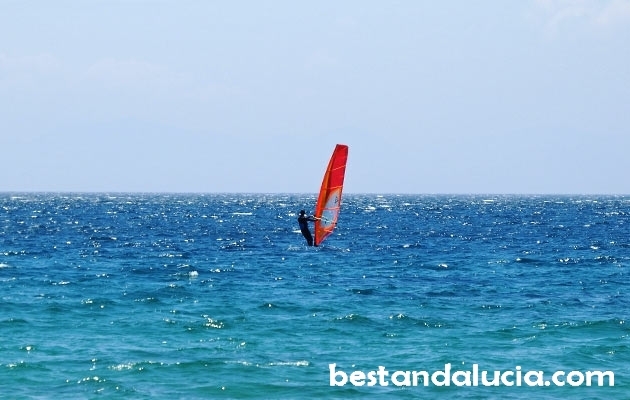 Tarifa windsurfing – Playa de los Lances is one of the favourite spots for windsurfing in the Andalusian capital of water sports. You will find here lots of kitesurfers and windsurfers all year round. Another very busy spot, bordering Los Lances beach, is Playa de Valdevaqueros. 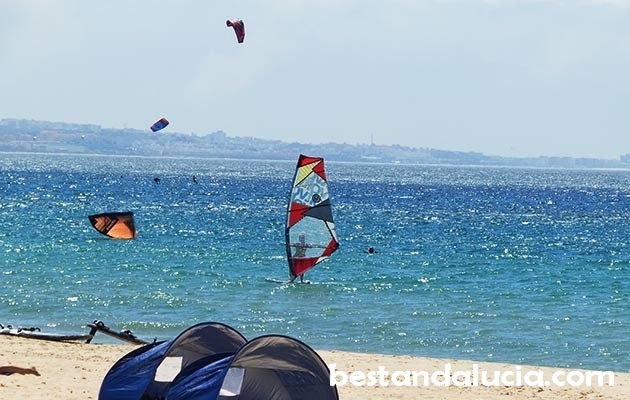 In Tarifa, you will find lots of windsurfing schools and renting shops. Recommended to everyone. 2. El Palmar near Conil de la Frontera windsurfing – very long beach, nearly 5 kilometre long, with good surfing schools. It is directly exposed to the wind what makes it absolutely excellent for windsurfers and surfers. 3. Ayamonte windsurfing – located at the border between Spain and Portugal, the tranquil and peaceful Ayamonte offers excellent conditions for windsurfers. 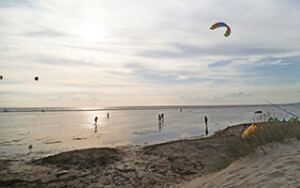 The sandy beaches of Isla Canela provide a beautiful backdrop for windsurfing. Because of the proximity of Atlantic Ocean the currents and winds tend to be much stronger here. Recommended to experienced windsurfers. 4. Valdelagrana windsurfing – in Puerto de Santa Maria, near Cadiz – large beach, nearly 2 kilometre long, very popular among windsurfers from Cadiz. There are some good chiringuitos and restaurants near the beach. There is a big parking available there as well. 5. Chiclana de la Frontera windsurfing – nearly 6 kilometre long Playa de la Barrosa is another great windsurfing spot. The winds are moderate here, so it might be a good sport for beginners. 6. Embalse de Bornos windsurfing – big reservoir near Arcos de la Frontera might be a good choice for beginners. 1. La Herradura windsurfing – near Almuñécar on the Costa Tropical – tropical vegetation, beautiful virgin landscape all around you, wide beaches and the blue Mediterranean sea. All this has helped La Herradura become the capital of water sports on Costa Tropical. You will find here windsurfing schools, shops with equipment quality chiringuitos and great atmosphere for windsurfers. 2. Roquetas de Mar windsurfing, near Almeria – this popular resort, boasting more than 10 kilometres of beaches, has become increasingly popular among windsurfers in the recent years. Recommended for beginners.